I know a lot of you want to have people over for the Super Bowl. 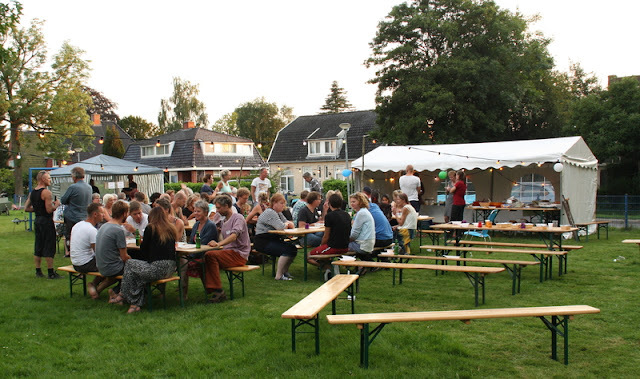 People love to have a Super Bowl fete—fans can grunt while they watch the game and non-fans can chat it up while their mates and friends are well occupied. So it's your turn to host but who has the time? We can help with this super simple, easy to host Super Bowl party theme. Let Party411 help you every yard of the way. Send a fun and easy Super Bowl Invitations with a little football confetti sprinkled inside it for a little extra kick. Personalize Your Party! Of course, you can choose from a great selection of Personalized Super Bowl 50 Invitations from Party411. Whichever you choose, get them out as early as possible to get the best response! Are you Ready for Some Football? Join us for a Super Bowl Party! This is your All Access Pass to Super Bowl 50 at Richardson Stadium! Come get your game on at the Miller Super Bowl Party! It's time for Super Bowl 50! We'll provide beer... you'll be in heaven! Team colors - You can choose one team to root for and go with their colors. If your group isn't greatly attached or strenuously opposed to one team or the other, decorate one side of the room with one team’s colors and the other half of the room with the other team’s colors. 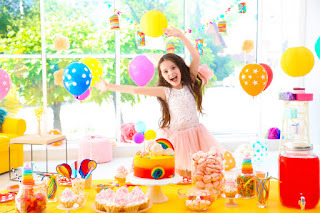 Use streamers and balloons for an easy and colorful party room! Crazy Fan - You know the one. With the face paint, no shirt, and the huge sign? Not that you want your guests running around shirtless getting facepaint on your furniture, but you can take the spirit of the crazy fan and use it for your theme. Use poster board and markers and create some crazy signs. You can use them as wall decorations! Give all of your guests wearables and noisemakers and you have a recipe for a rowdy and entertained crowd! Football - If you don't want to decorate for the specific teams, gear your decor to the game! Green tablecloths (the field) and football themed paper goods are way to go. Use red and yellow napkins (you know, penalty and challenge flags?) You can even incorporate black and white for the refs! Appetizers and Finger Foods- This is an excellent way to go. Focus on dishes that can be make ahead popped in the oven, or things that can be set out, such as cheese trays, dips and snack mixes. Pizza and wings can be ordered... nothing easier than that! Dips Galore - 7 layer taco dip, buffalo chicken dip, chips and dip, veggies and dip, guacamole, salsas, reuben dip, spinach-artichoke dip, marshmallow fruit dip... you have so many choices here! Taco/Burrito/Nacho Bar - Easy and AWESOME! Set out taco shells, tortillas and nacho chips along with all the fixings - slow cookers filled with ground beef, pulled pork, shredded chicken, and black beans. Shredded cheese and nacho cheese. A variety of salsas. Shredded lettuce, sliced jalapenos, olives, sour cream, taco sauce. Lots of napkins! Chili - Make a big pot and offer lots of cheese, sour cream, corn chips and cornbread to go with it! Fill your menu out with a few appetizers and chips and dip. Don't forget dessert - whatever you serve as your main attraction, cookies, brownies, cupcakes, frosted cookie cakes are all great bets. Start with Super Bowl Paper Goods. Fitting and easy to clean up. Create a backdrop for behind your buffet to give that all important area some pizazz. 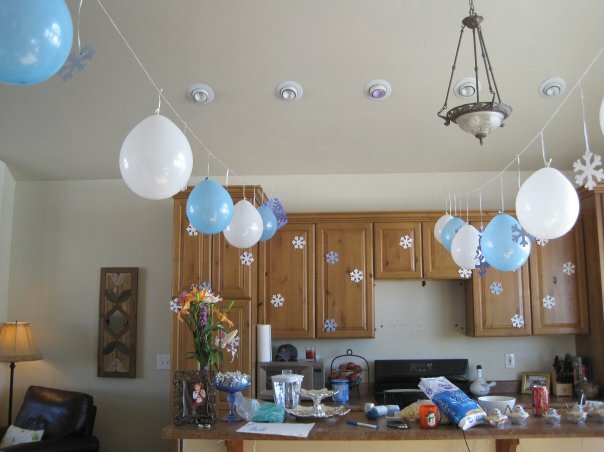 You can use a Custom Super Bowl Banner, balloons, or some string lights. Sprinkle some football confetti on your tables. Line up a few coolers filled with ice, cans of pop, bottles of water and beer. Just like tailgating! Colorful beads make perfect napkin rings...and favors! Create silverware bundles by wrapping the plastic wear with a napkin, and then wrap and secure that with the beads. We have a whole selection of Super Bowl Games and Activities to keep you and your guests busy during the time outs. The only thing better than watching the big game is betting on it. Set up a Super Bowl Pool Board and let the game begin! Personalize Your Party! Or you can use one of our Sports Photo Ops to turn your guests into a referee, a football player, or even a cheerleader. They will have a great time snapping shots, and you will be providing many happy memories! 5. Hand Out Favors to Say "Thanks for coming!" Beer Sunglasses are another big hit at our football parties. Throw your party favors into one of Party411's customized Super Bowl XLVII favor bags! Personalize Your Party! And, send them on their way with a sweet message on one of our Personalized Candy Bar Wrappers, or somePersonalized Super Bowl 50 lollipops!